“Flat is the new up,” said NASA’s new Associate Administrator for the Science Mission Directorate, John Grunsfeld, attempting to bring a bit of levity to the outlook for NASA’s proposed 2013 budget. Grunsfeld was speaking to a shellshocked community that will be taking the biggest hit in the NASA budget decrease: planetary scientists attending the Lunar and Planetary Science Conference this week in The Woodlands, Texas. There weren’t many jokes or laughs during Grunsfeld’s talk; nor from Jim Green, NASA’s Planetary Science Division Director. Both gave short remarks and then answered questions from the audience at “NASA Night,” the annual NASA Headquarters briefing event at LPSC. President Obama’s proposed FY 2013 budget would eliminate $300 million from the agency’s Planetary Sciences Division, a 21% cut from the $1.5 billion it received for 2012. “We essentially lost the ability to create new missions,” Grunsfeld said. Sitting among the people who, because of this proposed budget “whacking” (as Grunsfeld called it), will likely lose jobs or see their life’s work delayed or canceled, it was hard not to believe that this particular budgetary decision is wrong in every way possible. NASA would be slashing what many believe is the space agency’s most successful program. President Obama has stated he will see astronauts on Mars in his lifetime, so the plan to put the Mars program essentially on hold is extremely short-sighted, if not ironic. Grunsfeld said he and Green are there to fight for the scientists and the missions. “Jim (Green) could have thrown his badge on the table (in response to the budget proposal), but he decided to stay and fight,” Grunsfeld said. He offered hope by reminding everyone how in 2004 when he was NASA’s chief scientist, the decision was made to not do the final repair mission to Hubble. That decision was eventually reversed. “History tends to repeat itself,” he said. Jim Green, NASA’s Planetary Science Division Director speaking at the Lunar and Planetary Science Conference on March 19, 2012. Credit: John Blackwell/USRA. Grunsfeld and Green both stressed how the scientists — and anyone in attendance or watching the webcast of the event — should spread the word to the general public about the importance of planetary science and also about contacting their congress-people – the ones who make the final decision about the budget. But yet, NASA’s Education and Public Outreach budget has been cut from $136 million in FY12 to $100 million in the FY13 request. One of the most perplexing issues about the budget cuts is how NASA’s involvement in future international Mars missions, an orbiter and lander called ExoMars — with instruments and science teams already selected for parts of the mission — would be cancelled. This leaves the international partners in the lurch, damages NASA’s reputation among the international science community and puts in doubt the possibility of any future collaboration. Yet, Green said in his talk that NASA needs to “deliver on our international commitment,” and NASA officials often tout the incredible success of the international cooperation of the International Space Station – saying it is a model for future international missions. NASA Administrator Charlie Bolden has asked the Science Mission Directorate and Grunsfeld to reformulate an agency-wide Mars exploration strategy, where they are now suggesting a smaller, US-only Mars mission in 2018. But could a smaller mission be less expensive and offer anywhere near the amount of science that could have been attained with the joint ExoMars mission? Grusnfeld and Green also suggested a future melding of science and human spaceflight-related missions as a way to get more funding for Mars missions. But when asked by Universe Today for an example of a “dream” Mars science mission within a scenario of a human spaceflight precursor, neither could come up with a really enticing idea. However, Grunsfeld said science at NASA would stand to benefit from developments in human exploration and space technology. “It might be a bit of a stretch, but imagine what kind of planetary mission you could launch with a 70 metric ton launch capability,” he said, referring to the Space Launch System’s big rocket that is in the preliminary stages of being developed for future human mission to either an asteroid, the Moon or Mars. One piece of good news: Green announced that the GRAIL mission has already received a mission extension, as well as MESSENGER, which was announced earlier. Still hanging in the balance are extended missions such as for Kepler and MER, the decisions on which will be made by this summer, Green said. The outlook for the start-up of production of Pu-238 is not brilliant – and for any future outer planet mission, this is crucial for power for the spacecraft, and ultimately, for science. The Department of Energy did not receive any funding for a re-start, so it looks as though NASA may have to go it alone and pay the entire costs of start-up and reproduction. So, it may come down to grassroots support for NASA to possibly change the current of action. While the administration proposes a budget, but it’s Congress that actually enacts the budget and appropriates the money, so anyone who is passionate on this subject needs to contact their representatives. Inspired by Neil de Grasse Tyson’s recent suggestion during testimony to Congress (see video below) that NASA should receive a full penny on the dollar of the national budget ($37.5 Billion) instead of less than half a cent at the $17.7 billion now proposed, a student named John Zeller has started a website, Penny4NASA., which offers templates for letters to Congress, petitions on Change.org and more. The Planetary Society is also mounting a campaign to restore the science funding to NASA. We’ll add more links to ways to support science and planetary missions as they come in. As expected, NASA’s 2013 budget request calls for an overall decrease in funding, with especially tough cuts to planetary science and education. The budget proposal of $17.7 billion is a decrease of 0.3% or $59 million from the 2012 budget and puts NASA at its lowest level of funding in four years. President Obama’s budget request for NASA includes a flat budget through 2017, with no out-year growth even for inflation. Using the phrase “very difficult fiscal times” countless times, NASA Administrator Charles Bolden tried to put an upbeat spin on the bad news during a press conference on the budget on February 13. Overview of NASA's budget request. While the proposal includes continued funding for the agency’s human space programs —including $4 billion for space operations and $4 billion for human activities for the International Space Station, nearly $3 billion for the heavy-lift Space Launch System and Orion MPCV, along with $830 million for the commercial crew and cargo — planetary science took a huge hit, especially the Mars science program, considered by many to be the “crown jewel” of NASA’s planetary program. Mars exploration would be cut by a whopping 38.5 percent, going from $587 million this year to $361 million in 2013. As predicted NASA has pulled out of the Exo-Mars collaboration with the European Space Agency, for dual Mars missions in 2016 and 2018, with no future flagship missions even in the offing, beyond the $2.5 billion Mars Science Laboratory rover, now on its way to Mars. The Science Mission Directorate budget, which includes planetary exploration, astronomy and Earth environment monitoring, would receive $4.911 billion in 2013 instead of the $5.07 billion it received in 2012. The NASA education budget was cut $36 million, down from $136 million in 2012 to $100 million in 2013. The only bright spot for potential future planetary missions is that a small amount of funding was included in the 2013 budget to look into the re-start of making Plutonium-238, the power source for outer-planet missions. However, the cut to exploration missions means there is no funding for any new missions to potentially use the power source, such as a spacecraft to study the moons of Jupiter or a Uranus orbiter, two projects that were a high priority in the Decadal Survey released by the science community in 2011. The reduction might also affect ongoing missions such as the remaining Mars Exploration Rover, Opportunity, the Mars Reconnaissance Orbiter, and the Cassini spacecraft orbiting Saturn. Those missions will be reviewed by NASA later this year. The James Webb telescope, notorious for its cost overruns and delays, would get $627.6 million for 2013, up from $518.6 million in 2012 and $476.8 million in 2011. Many see JWST as responsible for draining money away from planetary science. JWST won’t launch until 2018 at the earliest. Bolden said since NASA “replanned” JWST, they receive an accounting each month and so far the mission has been on-budget and on-time as far as meeting goals. “Through diligence and really paying attention to the budget and timeline, I think we can get this mission done,” Bolden said. Two other bright spots in the budget was that funding for Earth observation satellites would be the same as 2012, at about $1.8 billion and the Space Technology program would get $699 million, up from the $569 million Congress approved for 2012. As bad as the budget seems, according to some sources, things could have been much worse. The White House Office of Management and Budget had earlier asked NASA to submitted budget proposals at a 5, 10 or 15 percent cut. They may have been lucky to get only a .3% cut. Next week, the US National Academy of Sciences will release their decadal review of priorities for planetary science in 2013-2022, and it will be interesting to see how highly prioritized a mission to Jupiter’s enticing moon Europa will be. But according to Space News, word from the NASA Advisory Council’s planetary science subcommittee is that because of probable flat or declining budgets for building and operating planetary probes over the next five years, there will likely be no funding to begin development of a flagship-class mission such as a long-anticipated detailed survey of Europa. The only flagship-class planetary mission in the works is the $2.5 billion Mars Science Laboratory Curiosity. The Juno mission to Jupiter, scheduled to launch in August 2011, is a medium-class “New Frontiers” mission set to study Jupiter only and not any of its moons. The 2012 budget request for NASA, unveiled February 14, 2011 by President Obama, would boost spending on planetary science activities from the current level of $1.36 billion to $1.54 billion next year. But funding would steadily decline over the following four years, to $1.25 billion in 2016. 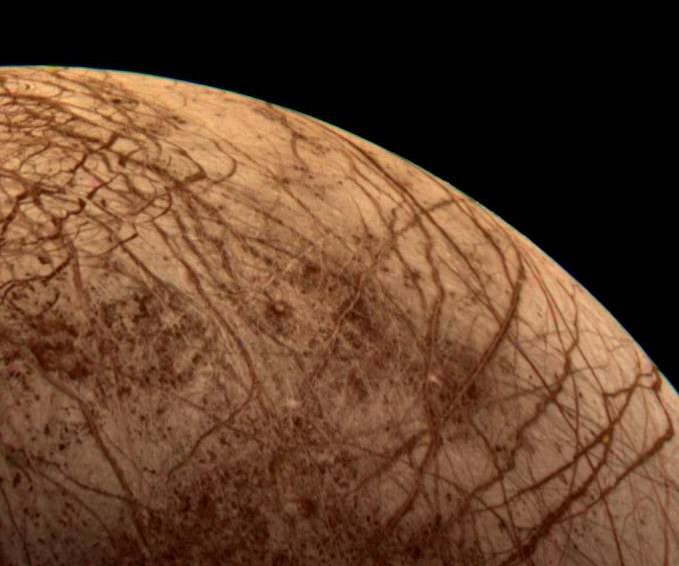 Many have long hoped for mission to Europa, but budgetary issues have been a problem, even the past; the JIMO (Jupiter Icy Moon Orbiter) mission was canceled in 2005 because of lack of funding. ESA and NASA have been studying a collaborative mission called Europa Jupiter System Mission/Laplace that would send two spacecraft to survey Jupiter and its moons. It is one of three candidates for a large-scale science mission opportunity that would launch around 2022. ESA has budgeted about $1 billion for the opportunity but is awaiting decisions from NASA and the Japanese space agency, which is collaborating on another candidate mission, before making a final decision on which one to pursue. NASA officials put on happy faces on February 14 to discuss their new budget proposal for Fiscal Year 2012, but it wasn’t exactly cheerful news. President Barack Obama proposed freezing NASA’s budget at the 2010 level, and called for a five-year freeze on new spending for the space agency. This would put NASA at $18.7 billion annually through fiscal 2016. Gone is the 1.6-percent increase NASA had sought for fiscal 2011, which ends in September, as well as the promised steady increases of an extra $6 billion over five years. But, truth be told, no one knows for sure what level NASA will be funded during this tight financial time, and the conservatives in Congress have talked about not just freezing the budgets of agencies like NASA, but reducing them. A temporary spending measure signed by President Obama on December 22 means NASA and other government agencies will stay at 2010 funding levels until March 4, 2011. This means, according to Jeff Foust at Space Politics, that among other items, the prohibition in the FY10 appropriations bill that prevents NASA from terminating any Constellation programs remains in effect, despite the human spaceflight plan enacted in the NASA authorization act signed into law in October. The temporary measure, H.R. 3082, known as a continuing resolution, was passed by the House of Representatives on Dec. 21. With its signing by the president, NASA will continue to operate at spending rates proportional to the $18.72 billion appropriated for all of 2010, according to Space News. An earlier version of the bill would have funded the federal government for the remainder of fiscal year 2011 and would have increased NASA spending by $186 million over 2010 levels and provided authority to cancel Constellation contracts and initiate new programs in the current fiscal year, but the measure stalled in the Senate under Republican opposition to earmarks contained in the $1.1 trillion funding package. The continuing resolution, however, doesn’t not specify what money at NASA should be used for specific items, and so the additional shuttle flight that was deemed a certainty in the NASA Authorization Act of 2010 that Obama signed into law Oct. 11, will likely still happen, but it’s not a sure thing. NASA spokesman Michael Cabbage said the agency was still reviewing H.R. 3082, but “The continuing resolution by itself does not endanger the extra shuttle mission, because on an annualized basis the continuing resolution provides enough funding to fly the mission,” Cabbage was quoted in Space News. So while NASA can’t cancel its Constellation contracts, the lack of specificity for NASA programs in H.R. 3082 gives the agency authority to continue developing a the Orion crew vehicle for deep space missions as called for in the authorization act. And because Congress provided $100 million for development of a heavy-lift rocket in the 2010 appropriation, NASA could begin work on that or a similar vehicle as directed in the authorization measure – all the while still paying for Constellation. And the continuing resolution could pose potential problems for NASA’s Commercial Orbital Transportation Services (COTS) program, said Space News. Under Obama’s 2011 budget proposal, NASA would have received $500 million for the effort to help commercial companies develop rockets and cargo ships capable of resupplying the space station. But because the program is new, and was not funded in the 2010 appropriation, NASA could be left to await new appropriations legislation before it can get started. Many other NASA programs face uncertainty in their budgets, as well. The US House of Representatives voted late Wednesday to accept the Senate’s version of NASA’s $19 billion fiscal 2011 budget proposal. The bill will now go to President Obama for his approval and signature, and if approved would provide $60 billion for NASA over the next three years, with money for development of commercial spacecraft, a heavy lift vehicle for NASA, technology development – including in-space tech such as fuel depots – and one additional shuttle flight in 2011. The Constellation program would be officially dead, although the Orion capsule would still be developed, and the next human destination in space will likely be an asteroid. The House voted 304 to 118, with no amendments allowed, in favor to approve the budget in a final series of votes before Congress recesses for the November 2 mid-term elections. The bill would keep most of the major changes in NASA’s future that Obama proposed in February of this year, while giving better direction as to where, when and how. You can see a list of how the representatives voted at this link. $3.99 billion of the new budget would go towards exploration in fiscal 2011, $1.3 billion for a new deep space capsule and $1.9 billion for initial development of a new heavy lift rocket. Additionally,the bill would provide $144 million to support on-going development of unmanned spacecraft to deliver cargo to the International Space Station and $312 million for commercial crew spacecraft. Space operations would receive $5 billion, including $2.8 billion for the International Space Station. NASA Administrator Charlie Bolden was understandably relieved and ecstatic about the passage. You can read more reactions over at Jeff Foust’s Space Politics website, and see this link from Hobby Space for a plethora of news reports about the bill’s passage. Space Politics by Jeff Foust shares an email from SpaceX founder Elon Musk asking for US citizens to contact their representatives to vote no. (There are instructions there on how to contact your representative, as well). The Planetary Society put out a press release asking for a delay in the vote until there’s been more discussion and debate. More on the inside stuff going on in Washington regarding NASA from Space News. If you are undecided, take a look at this comparison of the House and Senate versions of the bill from The Space Foundation. Irene Klotz at Discovery Space uncovered some stealth funding for Constellation hidden in a bill regarding the war in Afghanistan. The people behind the DIRECT launcher call for support of the Senate version of the bill, not the House’s. Space News now reports that a vote on the NASA bill appears unlikely until September. Here’s a pdf letter from two unions, the International Federation of Professional & Technical Employees (IFPTE) and the American Federation of Government Employees (AFGE) who both oppose the House NASA Reauthorization bill, HR 5781. The U.S. Senate Commerce, Science and Transportation today unanimously approved legislation that would add a shuttle mission and jump start work on a heavy-lift rocket next year. The NASA Reauthorization Act effectively cancels the Constellation program, but directs NASA to begin work immediately on a new heavy-lift vehicle to be ready by 2016, along with a crew vehicle. The new legislation takes money away, however, from two main focuses on Obama’s proposed budget: commercial space development and funding for innovation and breakthrough technologies. Commercial space ventures would only get $1.6 billion for development in the next three years, as opposed to Obama’s plan for $3.3 billion on commercial rocket companies between 2011 and 2013. Obama had proposed $6 billion over five years for technology development whereas the new Senate bill funds advanced technologies at about $950 million over three years. Both of these components are a big disappointment for those looking towards the future and not necessarily honing in on the short-term of the next few years. The plan, mainly spearheaded by Florida Senator Bill Nelson is said to be a compromise between Obama’s plan and those in Congress who opposed it. “The goal was to preserve U.S. leadership in space exploration and keep as much of the rocket-industry talent as possible employed,” said Nelson, following Thursday’s unanimous approval of the authorization bill. Nelson said extending the space shuttle into 2011 keeps much of the KSC workforce in place and advances heavy-lift rocket development, with an eye toward manned flights nearly a decade earlier than 2025, as had been proposed by the White House. It also provides the money for operating the International Space Station through 2020. Some, including business and space advocates on the Space Coast, were critical of the draft bill because it scaled back President Obama’s proposed funding for that program and for technology development, both of which could create jobs. The heavy lift development would be started now instead of 2015, as proposed by Obama. But is creating a heavy-lift vehicle by 2016 doable, or is it basically asking NASA to do too much with too little – to which Constellation fell victim? Although Nelson said the bill would support an overall growth in science, aeronautics, and space technology and define a long-term goal for human space flight to expand a permanent human presence beyond low-Earth orbit, no particular destination was cited. The ISS would remain funded until 2020. For education the new bill would support new education initiatives, such as teacher training programs, to reinforce NASA’s role in developing a workforce with strong science, technology, engineering, and mathematics skills. The bill would require NASA to look at alternative management models for NASA’s workforce, centers, and capabilities, while enforcing short-term prohibitions on major center displacements and reductions-in-force until a job study is completed. Weigh in on your opinions below. What’s next? The White House will probably respond with another compromise, and those who work at NASA will remain in limbo while another compromise is worked on. Where do you think NASA’s next destination should be in space? Asteroid? The Moon? Mars? The Planetary Society is hosting an interactive Ustream chat where you can put in your 2 cents. “Tell us where you want to go in space!” said Bill Nye (the Science Guy) who will soon become the Planetary Society’s new executive director. Nye and Louis Friedman, the Society’s current executive director, will host the live chat – titled “The New NASA Plan – Destinations” — on Wednesday, July 14, 2010 at 2:00 pm U.S. Pacific Time (5:00 pm EDT, 21:00 GMT). “We want a lively debate!” said Friedman, who urges anyone to join the discussion. The Planetary Society has been actively encouraging discussion of the new plan proposed for NASA, a plan that would entail a major shift in NASA’s human spaceflight program. The Society leadership feels that it is vital that public interest be represented in discussing issues that will change the course of the US space program for decades to come. The new NASA plan for human spaceflight focuses on technologies and milestones that will advance human space flight out of Earth orbit and into the solar system. Mars may be the ultimate goal, but the path for humans to set foot on the Red Planet is flexible, to be determined step-by-step. The Planetary Society plans to continue to hold webcasts on topics such as the deep space rocket, use of commercial launch vehicles, and robotic precursor missions. Those wishing to participate in the Ustream chat room or to ask questions will need to set up a free account with Ustream prior to the start of the event. The New NASA Plan — Destinations will also be archived on Ustream for later viewing.